It's the backdrop of the legendary Monaco Grand Prix. It's been featured in no less than two James Bond movies. Not to mention To Catch a Thief, the Alfred Hitchcock thriller starring Grace Kelly that filmed in glitzy Monaco, where she met a prince and then became Princess Grace. Casinos, royalty, yachts and auto racing. Her Serene Highness, Princess Charlene of Monaco, is the godmother of the Regent Seven Seas Explorer, said to be the 'most luxurious cruise ship ever built'; it's right at home in the storied glamour of Monaco. During christening ceremonies, HSH cut a red velvet ribbon, which sent a Primat bottle of Veuve Clicquot champagne smashing against the ship’s hull to officially christen the newest member of the Regent Seven Seas Cruises fleet. 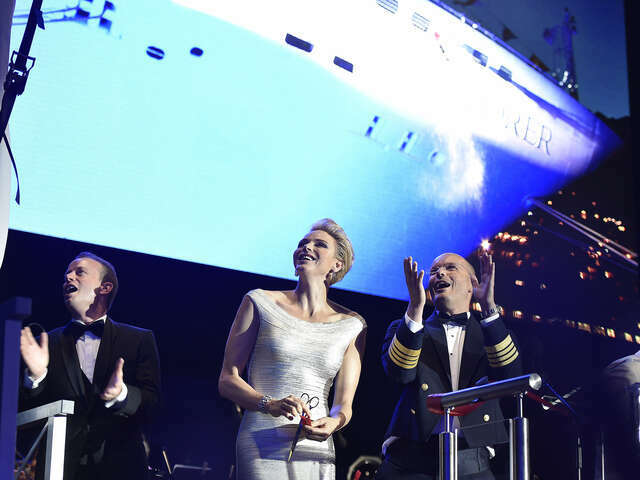 The jubilation of the bottle breaking moment was followed by a spectacular 40-minute private performance from musical maestro Andrea Bocelli, capping an incredible launch for a ship that sets new benchmarks for luxury. As a former Olympic competitive swimmer, and Princess of a country on the Mediterranean, it's fitting that the Princess' humanitarian efforts include the Princess Charlene of Monaco Foundation, whose mission is to save lives by teaching children and adults basic water safety techniques. The Foundation sponsors a number of “Learn to Swim” and “Water Safety” programs in 27 countries throughout the world, including in the United States. Discussions are underway to implement the Foundation's Water Safety program on all the company's ships.